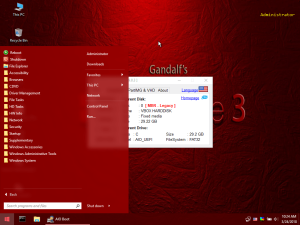 Gandalf’s Windows 10PE is one of the famous builds from Win10PE SE. You can easily integrate it and these versions into AIO Boot. Win10PE SE is a tool that helps to build a WinPE version from a Windows ISO file with many features. WinPE 10 of AIO Boot is also built from this tool. You can use this tool to add various components such as Desktop, Explorer, .NET Framework and SysWow64 (to run 32-bit apps on 64-bit WinPE) into WinPE. And there are many other software and utilities that you can integrate into WinPE. There are two versions built from this tool that I would recommend here: Gandalf’s Windows 10PE (x64 and x86) and Bob.Omb’s Modified Win10PEx64. List of softwares, Gandalf’s Windows 10PE x64 version 03-13-2018. To support UEFI, AIO Boot will extract the boot.wim file from the ISO file, and repackage the ISO file to remove the file to save disk space. ISO files may contain files that are blocked by antivirus programs, disabling them if repacking fails. Download Gandalf’s Windows 10PE and Bob.Omb’s Modified Win10PEx64. Browse to the ISO file that you downloaded, click OK to integrate. Some portable software needs to write their configurations to the .ini file, but they are in an ISO file that ISO9660 is write-protected. Therefore, these software can not be run. To support these software, you can create a PartIMG file from ISO, then boot it with PartIMG Mapper or Partition Image Mapper. Or simply use the ISO file extract method as I have instructed for Bob.Omb’s Modified Win10PEx64. Because these versions have the same directory and file structure, you can only integrate one version. How istall Windows PE 10 v2.2019 + x64 8.1 x64 3.5 8 v2.8.b7 7 v1.0.4b от Ratiborus? Many thanks, this is truly an amazing piece of software – can’t imagine how you managed to integrate Explorer to work seamlessly with Windows PE. Can you please update this to support the latest Gandalf build from 07-10-2018? The last build from 05-08-2018 works, but the latest build does not split the boot.wim and complains that the file is over 4GB for FAT32. This is using your latest build v0.9.8.12. You need to format the drive to NTFS instead of FAT32. You can create two NTFS and FAT32 partitions for booting in UEFI mode. I have a question.. Can you integrate both the WinPE and Windows 10 into AIO boot so that you can select which one you want to use? Because I would like to have it so that if I want to diagnose a problem then I use winPE and if I just want to install win10 then I use the win10 selection. Right now I have it setup so I am just installing the win10 over my network but again I would like to be able to integrate the winpe for diagnosing issues and also to be able to copy data from a hard drive that cannot boot into windows if I need to do so..
Oh and I absolutely LOVE your software. It is great and I am going to donate to you as much as I can in the next week when I get paid..
hello, I can not find any link to download gandalf winpe. What version is the previous version? Help me test this version please, thank you. Please send me the file /AIO/Tools/error.log. Try disabling the antivirus program on your computer. Sorry, I don’t know the cause of this error. You can boot into WinPE, then run AIOCreator.exe to integrate. I managed to integrate the bobs winpe but when I boot to it over the network for some reason alot of the software tools don’t show up? Any idea why? And i used the iso that came with bobs win pe? However I also created a USB using the same iso with the tool that came with bobs win pe and it has all the tools you listed above?